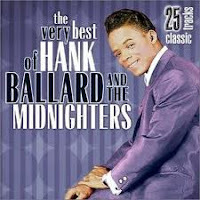 There’s a thrill up on the hill, so that’s where we’ll convene this week’s 3 Chord Club as we learn three R & B classics from Hank Ballard & The Midnighters. Never heard of Hank? Well, he invented The Twist! And, hey, this is also the 52nd weekly meeting of the club, which means The 3 Chord Club is one-year old. If you’re new to the club scroll down the page and on the right is the full archive of past meetings and the artists that have been featured at the club. And remember, Happy Birthday is a 3-chord song! Each Friday we choose three songs from a specific artist, label or genre of music that we’ll learn by ear. All the songs will contain three chords or less! You’ll find links to the lyrics but not the chords. That’s where your ears come in. Since you know the song has only one to three chords, try to figure out the changes, or chord progression by ear while watching the YouTube video. Here’s a hint, most of the time the chords will be the I-IV & V or V7 chords. In the Key of C, that’s C-F-G or G7. Remember, the sound examples may be in various keys. As an added bonus, try to figure out the key of the recording.I’ve added a new Video Hints section to the 3 Chord Club. I would suggest trying to determine the original key and the chord progression of the songs before watching the Video Hints. If you can’t figure out the original key and the chord progression of a song or songs, then watch the hints. Remember, ear training takes practice. Don’t get frustrated, have fun!